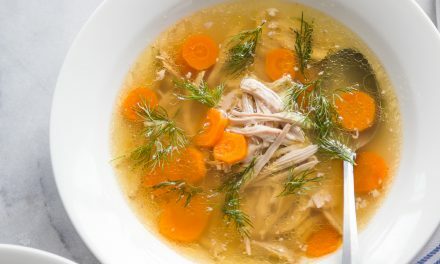 This recipe was developed in partnership with 8Fit. As always, any and all opinions expressed are mine alone. 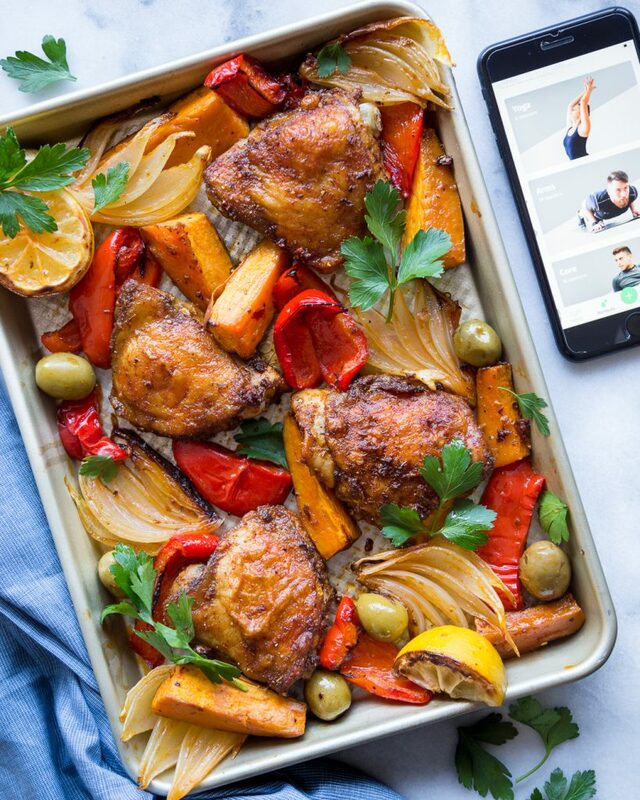 A few months ago I teamed up with 8Fit, an award-winning, fully integrated fitness app, to create a healthy and delicious recipe. I truly believe fitness and food are the pillars of health. However, I know from personal experience that juggling a full-time job, growing an online platform and taking care of two hyperactive schnauzers can make it challenging to find time for working out and home-cooked meals (even for someone who loves to cook as much as I do). 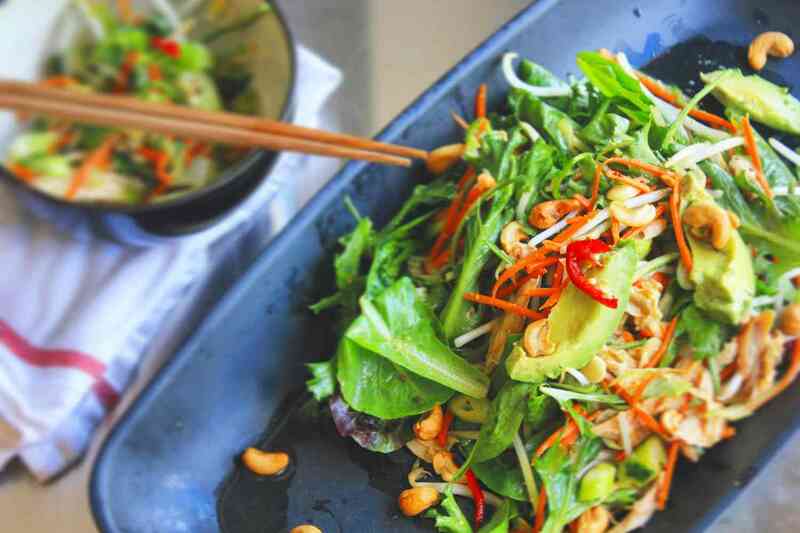 That’s why I wanted to create a recipe that was easy, delicious, nutritionally balanced, could feed a crowd, and all be cooked in the time it took to complete an 8Fit home workout or yoga session. 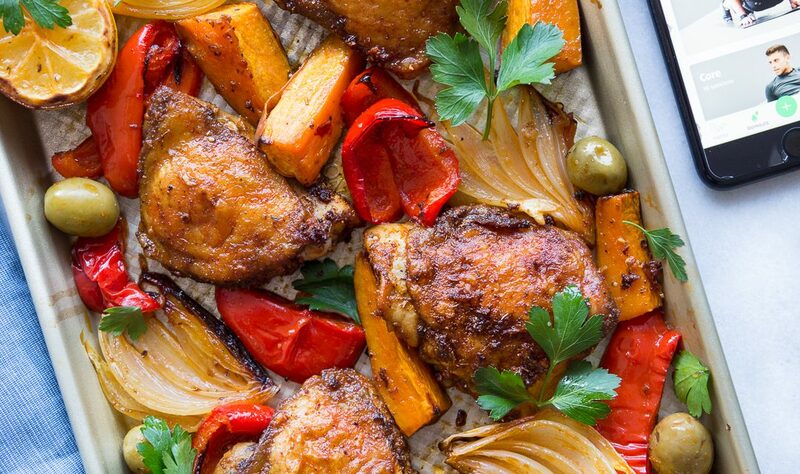 This Sheet Pan Spanish Chicken with Sweet Potatoes & Peppers ticked all those boxes. I’m talking only a few minutes of easy prep work and 40min of inactive cooking. It’s loaded with lean protein, nutritious veggies and complex carbohydrates. Did I mention everything gets roasted on a single sheet pan? In other words, clean up is a breeze! Also, the measurements can be easily adjusted depending on how many people or days you’d like to cook for. I have no problem admitting that I am a slow adopter of technology. Some would even go so far as to call me a sceptic. I tend to be fairly old school and most of the time I prefer analog over digital. I mean, I still carry a Moleskine agenda to keep track of my day-to-day affairs! Having said that, I’ve been using the 8Fit app for a little while now and am blown away by its functionality! 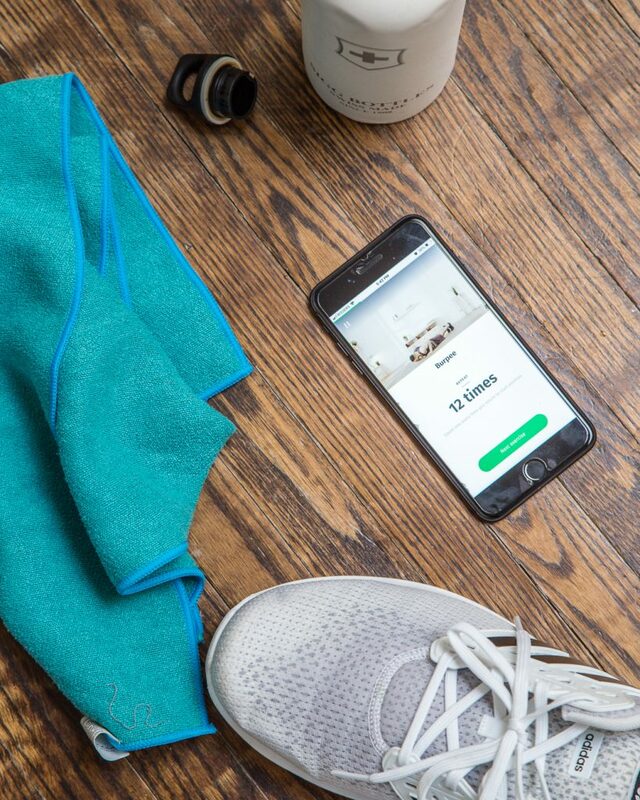 With one app, I can create a fitness plan that meets my personal goals and then schedule and track fully customizable workouts with the built-in calendar. I have the added benefit of video instructions to guide me through new movements. Built in timers and cues keep me on track throughout the workouts and the integrated playlists add some necessary tunes to keep me engaged. I love the fact that I can select workouts and programs based on my goals. If I want to burn fat, there’s a program for that. If I feel like building muscle, I’ve got plenty of options. I never have to think up a weekly schedule, workout routine, or the order in which exercises should be performed. I simply press play and follow the prompts on my smart phone. It’s like having a personal trainer in my pocket, except without the heavy price tag or unnecessary yelling! Speaking of price tags, I ditched my gym membership a few months ago so 8Fit has been extra helpful. Aside from cycling outdoors, almost all of my workouts are done in the comfort of my home. I realized a few years ago that I don’t need any fancy equipment or heavy weights to get in the best shape of my life. Almost everything can be done with a bit of creativity, just a few square feet of floor space, some chairs, and maybe a wall (for those killer wall sits). My wife loves it since she has access to guided Yoga routines and I’m looking forward to using the app while we travel! 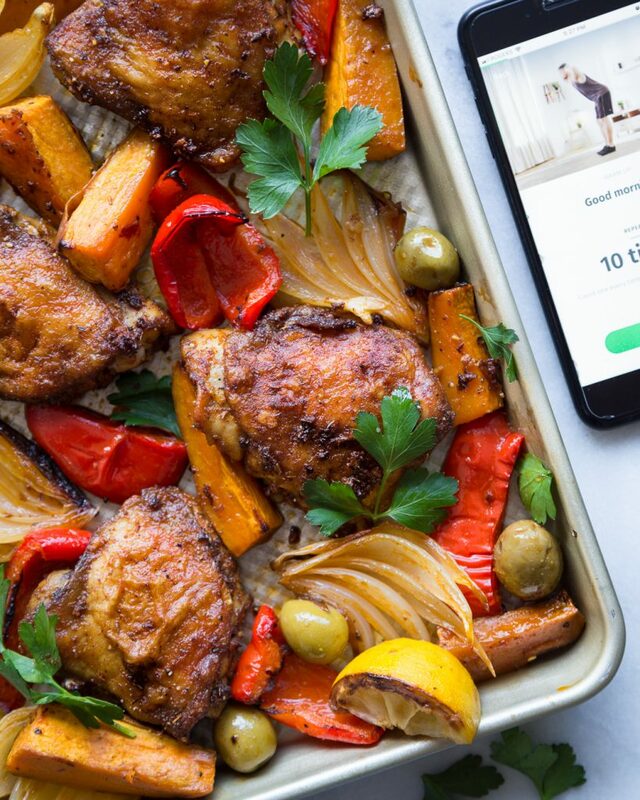 In addition to the fitness side of the app, I have access to over 700 delicious and nutritious recipes for all kinds of dietary needs, including Paleo! Depending on what I’d like to make, I can build a grocery list using the built in meal planner. 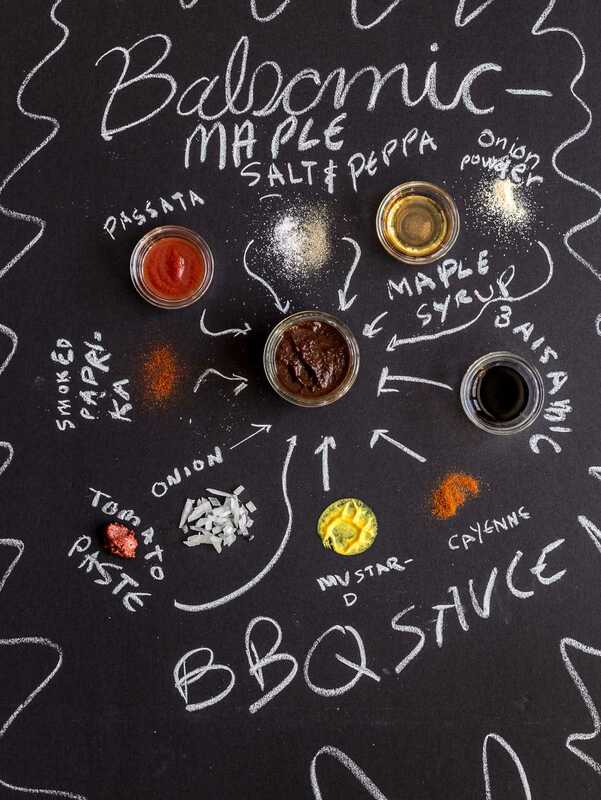 And if you’re a macro counter, you’ll love the nutritional profiling of each recipe. 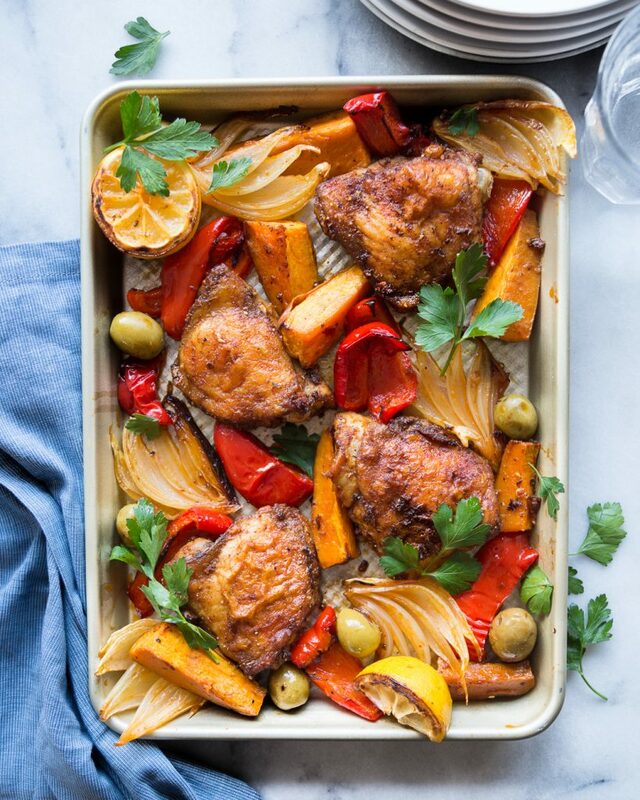 I’m thrilled to contribute this Sheet Pan Spanish Chicken with Sweet Potatoes and Peppers to the delicious recipe catalogue and am just as excited to try the other options! Visit 8Fit.com to learn more about the app or download on the App store or get it on Google Play. Rinse & pat chicken dry. 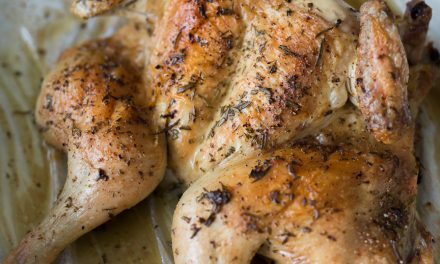 Season both sides with salt & pepper & add to a mixing bowl along with paprika, thyme, garlic powder, minced garlic & 2 tbsp EVOO. Toss to coat. Toss sweet potatoes, peppers and onions in 1 tbsp EVOO and a pinch each of salt and pepper. 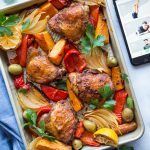 Lay veggies and chicken (skin-side up) on a sheet pan lined with parchment paper. Transfer to preheated oven and roast 40min or until internal temp of chicken is 185F (note: flipping veggies is unnecessary here). Add olives to sheet pan around the 30min mark.